So today as a mid week treat I've got a little product review for you lovely folks. Zoella is without a doubt one of the biggest internet stars of the last century, clocking up over 6,500,000 subscribers since starting her blog in 2009. I've been a faithful follower for a while now & was so thrilled to learn that she was releasing her own line of bath products - I just had to get them! Now usually I'd be pretty skeptical of 'celebrity' endorsed products, however I think the Zoella Beauty range is far from the usual stuff you'd find. 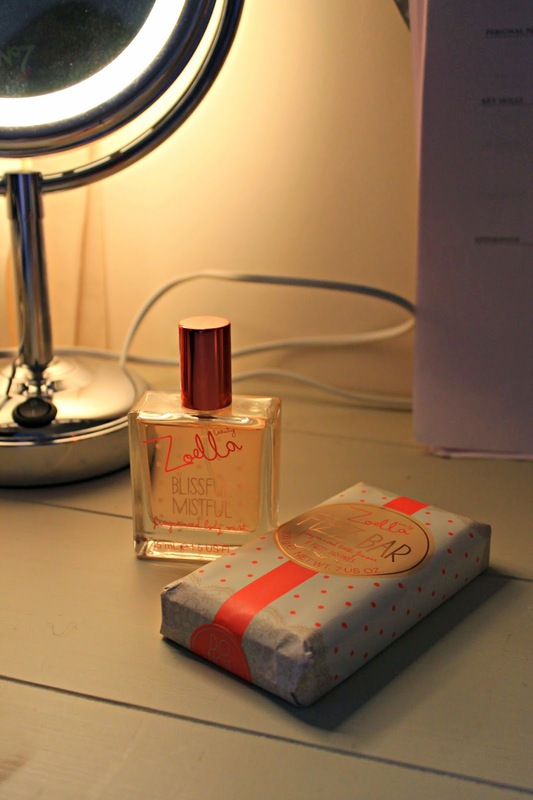 The packaging is absolutely adorable and 100% Zoellaified. The range really does appeal to her large fan base, providing a nice selection of pieces for both her younger fans and older alike. You can really tell that Zoe has put a lot of time & effort into the products and retailing at between £5-£8 they're a bargain for the amount you get for your money! When I popped into Superdrug a couple of weeks ago I decided to treat myself to a couple of items from the collection. I chose the 'Blissful Mistful' Body Mist' & 'Fizz Bar'. All the range has the same scent running throughout & honestly I adore it. It has a lovely fresh & floral fragrance which is super girly yet not too sweet and just perfect for relaxing. Out of the two my favourite is definitely the body mist - Purely for it long lasting fragrance. It's really nourishing on the skin too, which is a definite must after a long soak in the bath! While I did enjoy the bath fizzer I definitely think that you need to get the 'Soak Opera' bath cream to accompany this - as I found that they weren't particularly strongly scented. Needless to say I think the line is a massive success & I've already got my eyes on some of the other products in the range! Fingers crossed there will be more to come!